The 170 acre farm, actually called the Dayton Farm, was known locally as the Hardscrabble Farm. 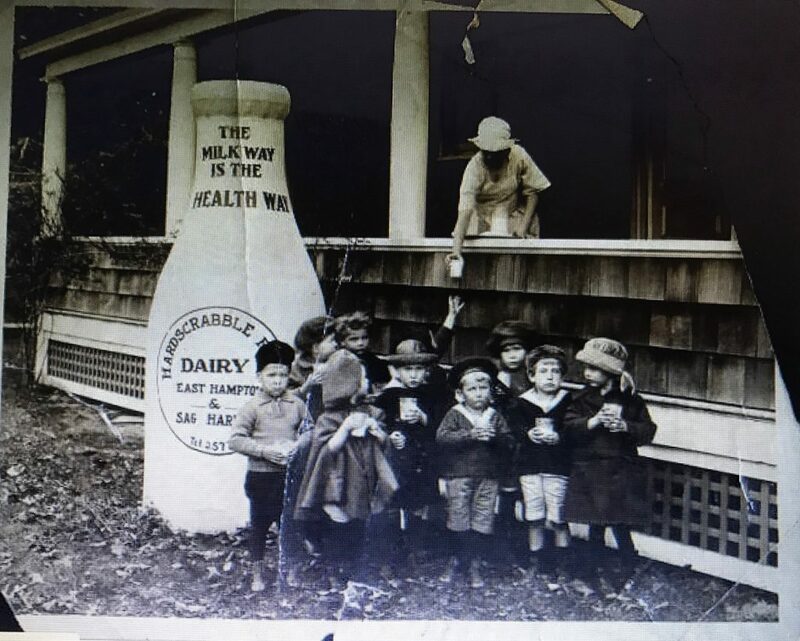 There’s a great undated picture in the East Hampton Library’s Long Island Collection that apparently shows school children visiting the dairy and being served glasses of milk. A brief description of the farm and it’s history is contained in a March 2, 1928 story in the East Hampton Star. Located on the Sag Harbor Turnpike (Route 114), it ran through to Hands Patch and Long Lane. At the time, besides operating a local milk route, the farm supplied a large part of the milk used at Sag Harbor. This large farm which has been in the Dayton family for the past four generations has been cultivated quite extensively for the past half century. Within the memory of the younger generation, when Mr. and Mrs. Josiah Dayton and Mr. Dayton’s father (Edward according to census records) made it their homestead, the farm was worked and it’s production was of quite some magnitude. For several years the Dayton brothers, including Josiah Dayton’s sons, Ralph, Edward T. and Robert J. Dayton did a truck business on a large scale. The farm was later converted into a modern dairy and under the ownership and management of the recent owner, R.J. Dayton, has grown to become one of the largest and best equipped milk producing dairies on eastern Long Island. The Dairy is equipped with a large cow barn, which accommodates seventy-two milking cows which produce a large part of the milk that supplies the Sag Harbor and East Hampton Market. Mr. Dayton was one of the first local dairymen to conduct a tuberculin test. Other modern equipment includes one of the latest sanitary bottle washers, milking machines, coolers, sterilizers, etc. The purpose of the East Hampton Star story was to announce the sale of the farm to Judge Samuel A. Seabury. Seabury was a State Supreme Court Judge and later Court of Appeals Judge famous for presiding over the Seabury Hearings, investigating corruption in NYC government. With the purchase of the Dayton Farm, Seabury increased his real estate holdings in the area to nearly 700 to 800 acres, practically all in one large tract. Dayton re-leased the farm and continued to run the dairy business after the sale. The milk supply locally has not kept pace with the growing demand, according to Mr. Dayton. During the summer months the dairymen are forced to import several hundred quarts from New York daily to supply the demand, which is at it’s height during the months of June, July, August and September. The milk is of poorer quality and does not measure up to the quality of the local supply or meet with the requirements of the new milk code…with this ready market and a well equipped plant to produce the product there are many who believe the newly organized concern will be a money-making project. 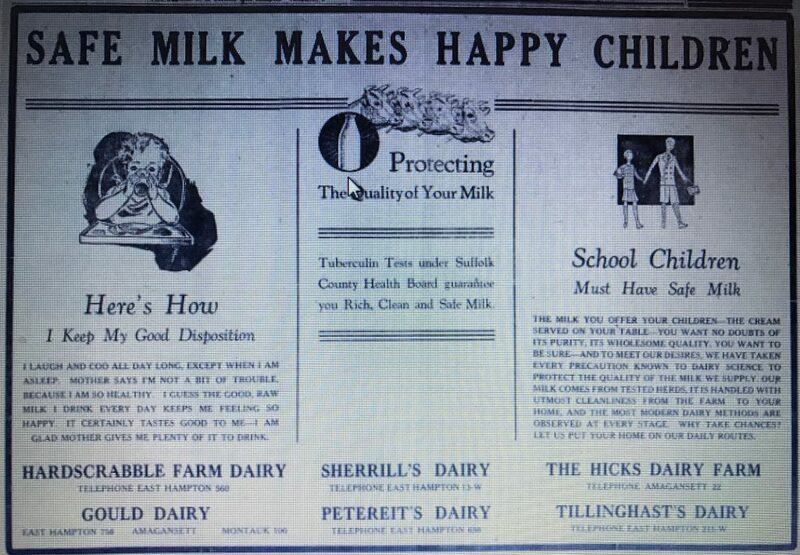 In the early 1930’s pasteurization allowed large milk companies to transport their product out to the east end of Long Island and compete with the local dairies. 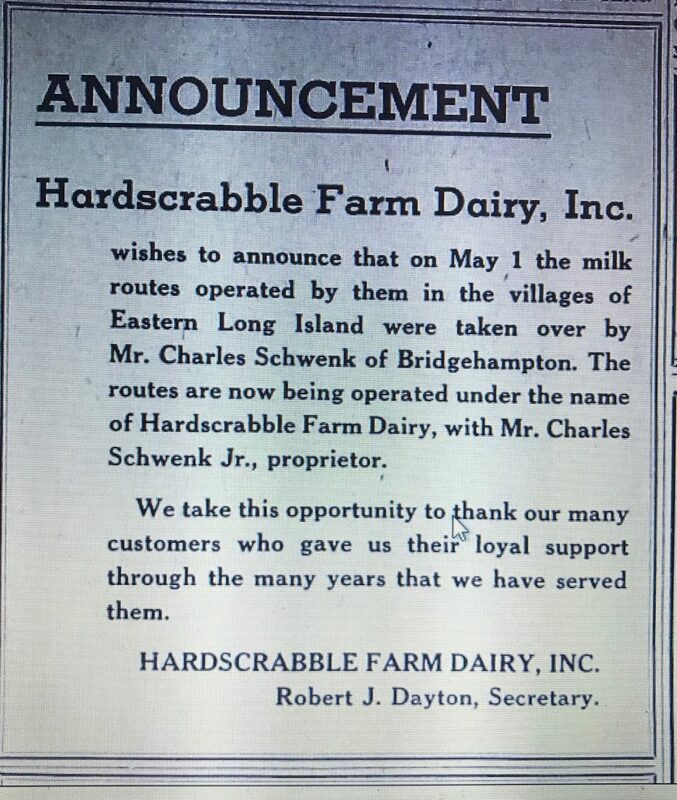 In an effort to maintain their market share, six local east end dairies, including Hardscrabble, banded together and launched a combined advertising campaign. The various advertisements stressed clean, safe, natural milk. Dayton continued to run the business until May 1, 1939 when Charles Schwenk Jr took over the routes.The announcement came in the June 15, 1939 issue of the East Hampton Star. Seabury sold the property to the Jemkarp Corporation of New York City. At least one of the new owners, J.M. Kaplan was local to East Hampton. Today much of the area remains a farm that runs a local farmstead called Dayton Farms at Hardscrabble. They sell vegetables, fruits, berries, flowers, baked goods and cheese. One of the Dayton owners long ago was supposed to have said that a lot of his land was so poor that it was a hard scrabble to make a living on it. Another family legend goes that Josiah (John) Dayton of Hardscrabble Farm, 150 years ago or so, had a carriage built, the first one in town with springs. It was considered such an extravagance that he waited a month before driving it to the village. When he did, everybody shook their heads and said “Josiah will have a hard scrabble to pay for that”. The bottle I found is a machine made quart with a slug plate. It was most likely made in the early 1930’s after the sale of the farm to Seabury. Previous Previous post: Ideal Dairy Co., 203 20th St.
Next Next post: Fred Beers, Inc., Ozone Park, L.I.